Product #21924 | SKU EHUSBBABX | 0.0 (no ratings yet) Thanks for your rating! 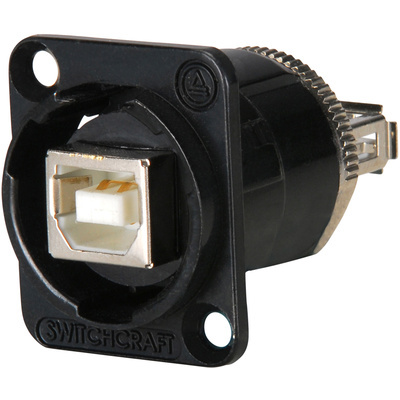 The black chrome finish EH Series USB B Female to USBA Female Connector from Switchcraft is built into the standard panel-mount XLR housing. Custom combinations of EH series connectors can be quickly loaded into any of the Q-G Series panels. Once mounted, connecting your equipment to the back of the connector is fast and easy. It is a feed through connector, which means standard cabling is simply plugged into the back of your gear and then plugged into the back of the connector. It also comes with mounting screws.